We’d love your help. 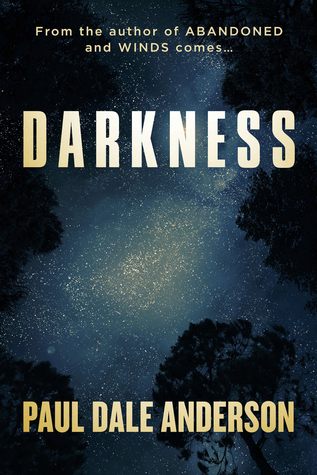 Let us know what’s wrong with this preview of Darkness by Paul Dale Anderson. An evil entity has hidden the sun, and the world becomes a dark and dreadful place. Biegolmai Davvii, a Saami shaman and one of the eight Guardians of the Four Winds, sends the Lone Ranger, a former US Army Ranger, and Jon Fish, a Marine Drill Instructor, to Machu Picchu to find the evil sorcerer who sacrifices women to acquire the power to control the sun. Jon is the rein An evil entity has hidden the sun, and the world becomes a dark and dreadful place. Biegolmai Davvii, a Saami shaman and one of the eight Guardians of the Four Winds, sends the Lone Ranger, a former US Army Ranger, and Jon Fish, a Marine Drill Instructor, to Machu Picchu to find the evil sorcerer who sacrifices women to acquire the power to control the sun. Jon is the reincarnation of the bodhisattva Akashagarbha, and he has the power to cross time and space. The Ranger is the reincarnation of the bodhisattva Vajrapani and he has the power to control winds and rain, thunder and lightning. But as long as an evil entity controls the vortex at the peak of Machu Picchu, neither man may access their bodhisattva powers and they must climb the mountain as mortals. After a fight with Elman’s minions, they are able to halt the sacrifices, but they are unable to capture Yam Elman, the twin brother of Guardian Hadad Elman. Elman escapes and attempts to take control of one of the other vortexes of power. To ask other readers questions about Darkness, please sign up. Paul Dale Anderson has written more than 27 novels and hundreds of short stories, mostly in the thriller, mystery, horror, fantasy, and science fiction genres. Paul has also written contemporary romances and westerns. Paul is an Active Member of SFWA and HWA, and he was elected Vice President and Trustee of Horror Writers Association in 1987. He is a current member of International Thriller Writer Paul Dale Anderson has written more than 27 novels and hundreds of short stories, mostly in the thriller, mystery, horror, fantasy, and science fiction genres. Paul has also written contemporary romances and westerns. Paul is an Active Member of SFWA and HWA, and he was elected Vice President and Trustee of Horror Writers Association in 1987. He is a current member of International Thriller Writers, Author’s Guild, and an Active Member of MWA and MWA Midwest. Paul has taught creative writing at the University of Illinois at Chicago and for Writers Digest School. He has appeared on panels at ThrillerfestXI, Chicon4 and Chicon7, X-Con, Windy Con, Madcon, Odyssey Con, Minncon, the World Horror Convention, and the World Fantasy Convention. Paul was a guest of honor at Horror Fest in Estes Park, Colorado, in 1989. He is currently the chair of the 2015 HWA Stoker Awards Long Fiction Jury.